This massive volume (900 pages) is part of the multi-volume Oxford History of America which began publishing back in the 1980s. The civil war is by far the most written-about event in American history, not least because more Americans died in it than in all other wars America has fought put together. The civil war tore the Republic apart, and the schism between north and southern states is in some ways still evident to this day. Certainly the bitterly divisive issue of race in America shows no signs of going away, ever. McPherson gives a good run-up to the war with a fascinating profile of economic and social progress in America in the half century from 1800. I was particularly struck by his interpretation of the movement of women from being cottage industry producers to the heads of nuclear households in which the male went out to earn a wage, as a big step up in power and autonomy for women. Also the importance of women in creating a market for consumer goods, which made America a pioneer in all sorts of household conveniences for the next century or more. And in creating an enormous market for an explosion of magazines and papers dedicated to women and women’s issues (homes and beauty etc). The bestselling novel of the entire 19th century, Uncle Tom’s Cabin, was written by a woman, Harriet Beecher Stowe. Women also established their dominance in the teaching profession, which has never gone away (in 2017 77% of teachers in the USA were female; the figure is 80% in the UK). In 1848 a convention in New York state launched the modern women’s rights movement (pp. 33-36). What comes over strongest is the inevitability of the war. 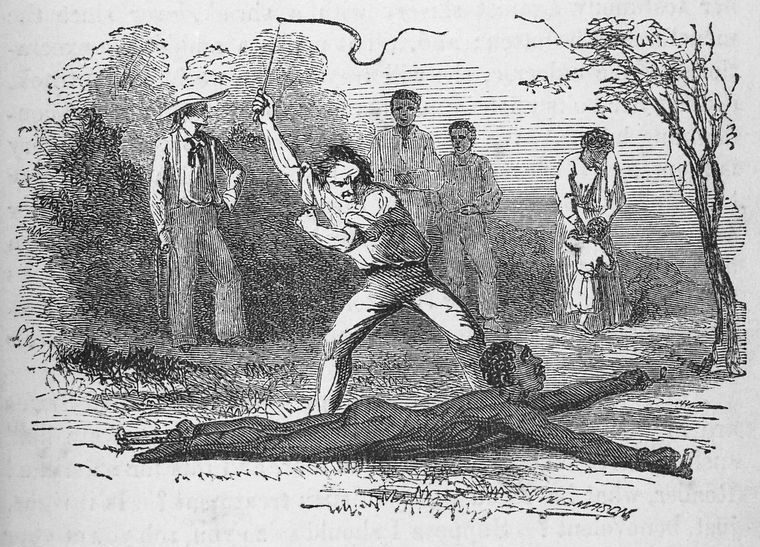 Conflict – bitter and angry conflict – between slave and free states exists from the very start of his account. (McPherson doesn’t mention it, but reading Alan Taylor’s account of the drafting of the American Constitution, it’s clear that slavery caused problems even then, back in the 1780s, with the northern participants having to find loose and ambiguous forms of words to take into account problems raised by slavery – for example questions like: what was the population of a slave state, should you include slaves as ‘people’ or not?). It takes McPherson about 300 pages to cover the period from about 1820 to the outbreak of war. Almost every page features rancour and disagreement caused by slavery. In fact slavery comes over as a curse of Biblical proportions on America. There is no way round it, no way out of it, no way of escaping the fact that the wealth of half the country depended on whip and chains. It fatally undermines all the vaunting rhetoric about freedom and independence spouted by northerners and the rebels of 1775, and they knew it. Slavery had been absolutely vital for the economic success of the southern states when the mainstay crops were rice and tobacco. As the nineteenth century progressed, cotton rose in importance, not least to be exported to feed the mechanised cotton looms of Manchester. Economically, slavery increased its importance in the southern economy and culture as the century progressed. 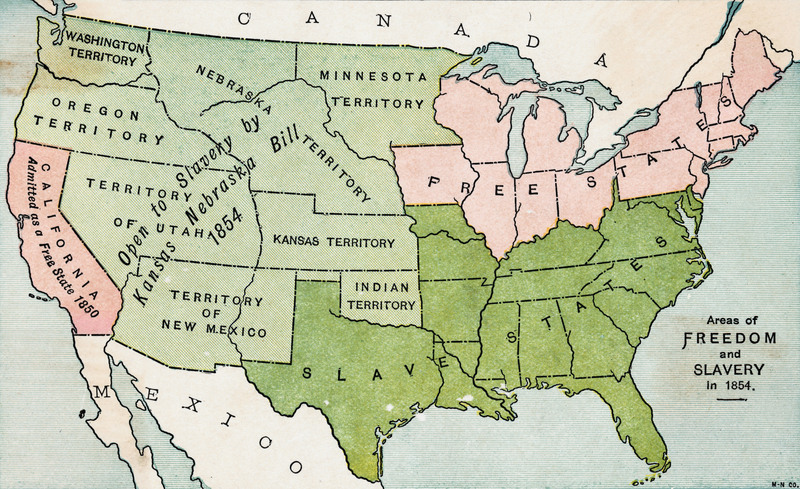 As America expanded, should the new states be slave or free? The most fundamental fact of American history in the 19th century was its relentless progress westwards, settling, staking out, defining and creating new states as it went. Every time this happened, there was virulent debate about whether the new state would be slave or free. Politicians and journalists were talking about a clash between the slave-owning southern states and the free northern states from the turn of the century. As early as 1820 a compromise had to be hammered out about just how much of the new territory of the Louisiana Purchase should be slave and free (the decision was that it should be slave-free above latitude 36′ 30) and the accession of each new territory caused a repeat of the same arguments, except louder and more bitter each time. The book really gets going with the arguments in the wake of the Mexican-American War of 1846-48. After American forces beat the Mexican army at a series of battles and then occupied Mexico City, the Mexican government was forced to cede California and New Mexico to America, and to give up hope of retrieving Texas which, for a while had been an independent state, before being absorbed in the USA. Mexico accepted the course of the Rio Grande river as its new border with America, losing a third of its territory to the States. But even as the Mexican war was being fought, politicians, lobbyists and so on were bitterly arguing whether about whether the new territory seized from Mexico should be slave or free. The crisis lasted from 1846 to 1851, with a series of political expedients and compromises in Congress under successive presidents. McPherson goes into very great detail about how the arguments around this issue were central to the campaigns for party nominations, in the presidential campaigns, and in various congressional and senate contests. At least that was the situation in the early 1850s. It is a central thread of the book to show how this rough grouping was torn apart and refashioned by the war. Personally, I find one of the most interesting aspects of history is the study of the reasons or arguments which lost. Historians often skip over these, assuming that nowadays we all agree, that the values of the present are self-evident and eternal. But for me that’s precisely a major value of the study of history: to enter fully into the economic, social and political mindset of people in completely different times and circumstances, to fully understand what drove them to believe and fight for their cause. Northerners thought these economic arguments explained why the northern free states were ahead of the South on almost all metrics, such as capital investment, literacy, industrialisation, innovation, and so on. And explained what was at stake in deciding whether new states should be slave or free: it wasn’t just a moral problem – allowing slavery in the new states condemned them to being second class economies. Allowing slavery into the majority of American states would doom the whole of America to becoming a backward, agrarian society. Intellectual southerners invoked the ideas of Thomas Jefferson. Jefferson thought that freedom amounted to economic independence based on the possession of property. He envisioned a nation made up of independent farmers and artisans who defined their own work rate, hours and products. Followers of Jefferson strongly opposed the spread of industrialisation in the north. Industrialisation converted free farmers into ‘hands’ who worked regimented hours in large factories, losing all their skills except the handful necessary to fit into mass production. Hence the expression ‘wage slaves’. By the 1840s everyone knew that industrialised society was prey to periodic depressions when trade collapsed and factories laid off workers in droves, to beg in the streets. Therefore, intellectual southerners could position themselves as principled opponents of capitalism, maintaining what they saw as older ideas of ‘liberty’ (for white people). These pro-slavery arguments are fascinating because you can see there is a grain of truth in some of them (in the virtues of an agricultural over an industrialised economy, for example). They were certainly enough to mobilise opinion right across the south, enough to produce a torrent of speeches and articles fulminating against northern arrogance and soulless industrial capitalism, enough to prompt endless threats that the south would secede or take up arms to protect her special interests – enough to drown out the simple, undeniable fact that slavery was an outrage against human decency, dignity and any ideas of ‘freedom’ or ‘justice’. To see how so many educated southerners – politicians, lawyers and journalists – managed to suppress this basic truth amid a flood of secondary arguments and justifications, is quite mind-boggling, and an education in human beings’ limitless ability to delude themselves when self-interest is at stake. This, and thousands of other statements like it, are virtually incomprehensible to us. But unless we make the effort to understand the almost unbelievable things people in the past have passionately believed in, we condemn ourselves to live in a world we don’t fully understand.